For lovers of television and charts, Graph TV—a clever interactive tool built by Kevin Wu—let's you visually explore the ratings of TV shows in the IMDB database. 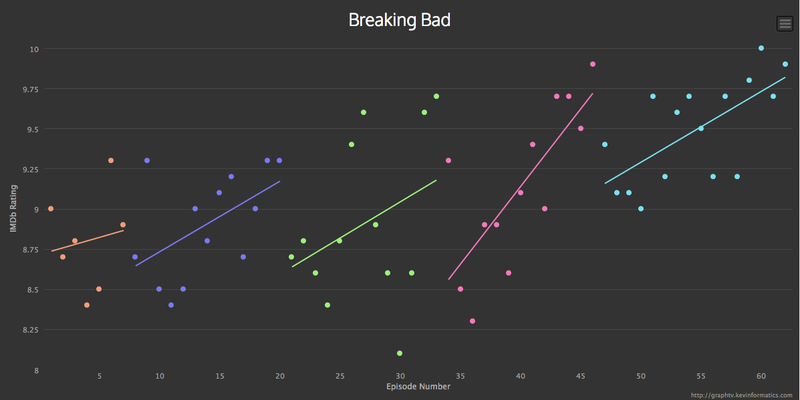 Over on the site itself, you can scroll over the dots for the titles and scores of individual episodes; the regression lines show the trend for each season. Not every season actually has a significant trend, so be careful with these (or check the provided r-squared values). Two obvious caveats. One, these are IMDB reviews, and IMDB reviewers think that The Shawshank Redemption is the single best movie in history. If the number of respected episodic TV reviewers continues to grow, it would be great to see a Rotten Tomatoes/Metacritic equivalent someday. Two, for all but the very most popular shows, the samples sizes aren't enormous. The site's been around for a while, but if I haven't seen it, it's new to me! (Family Guy / "I Never Met The Dead Man" / S1E2 / 7.8 rating.) With some healthy skepticism in mind, it's pretty addicting to mess around with. Go check it out.